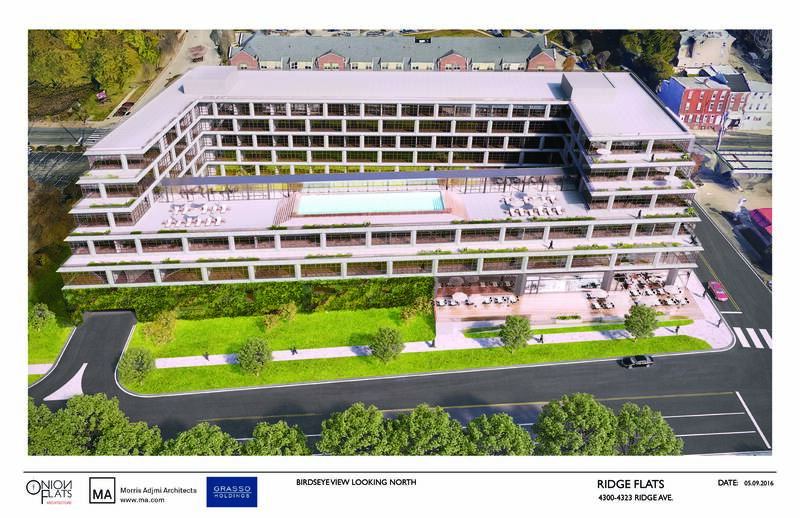 UPDATE May 31: Rivage gets approval from Civic Design Review Committee! And East Falls Local was there! 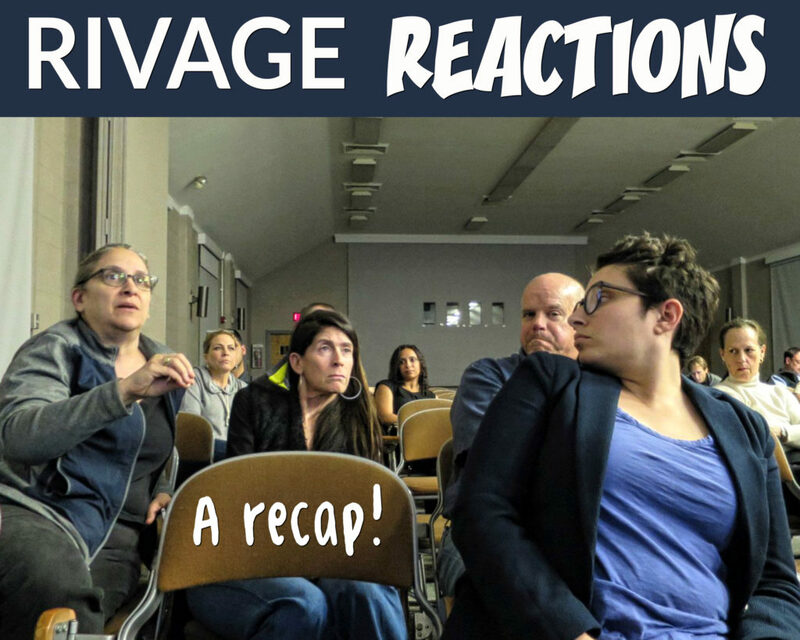 Steve’s not a huge fan of Civic Design Review, but when the Rivage project appeared on the CDR committee docket on May 31, he hustled down to 1515 Arch Street to speak up for the long-delayed project (and get some notes). Grasso started off the meeting, saying was eager to hear the Committee’s comments and hoped the input would make the project the best it could be. He also said he was open to any suggestions, provided they didn’t make the project financially unfeasible. Considering ways to break up the “monotony” of the façade on Ridge Avenue, perhaps through material and color changes. Placing bike storage/bike share in a more publicly accessible place, perhaps coordinating it with the restaurant space on Kelly Drive to add more life to that side of the building. Encouraging 3rd party energy efficiency certification, such as LEED. The Committee was divided on the benefits of the green wall, noting that diligent maintenance would be required to prevent it from becoming a “dead zone.” They also were split over the length of the “lay-by” lane on Calumet, with some feeling that a two-car lane was sufficient while others felt three car lengths a better solution for such a heavily trafficked area. These issues were apparently not significant enough for the Committee to bring Grasso’s team back for a second round of reviews. They therefore quickly voted to conclude the process. Grasso and his team go before the City Planning Commission on Wednesday August 3 at which time Nancy Trainer, the Chair of the Civic Design Review Committee, can pass along the Committee’s suggestions to her fellow Commissioners as they weigh approval of the Rivage variances. Big turnout & strong support for new development in the heart of our riverfront district. Grasso Holdings’ plan includes traffic improvements and a grocery store, but some neighbors worry about scale and orientation. Also, we attack people on the internet! 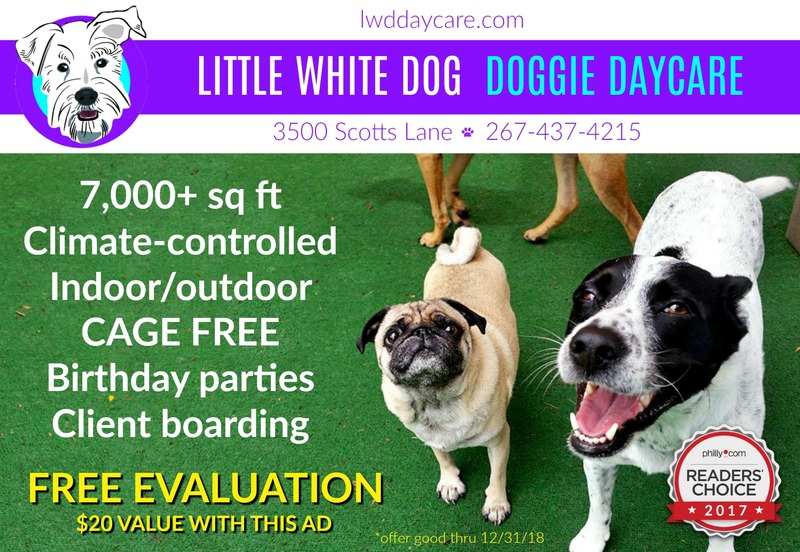 If you’re sick of the empty, trash-strewn lot at the foot of the Falls Bridge (last known as the site of Rivage Nightclub), have we got good news for you! The East Falls community came out in droves to this month’s neighborhood Zoning Meeting, most offering their support for Grasso’s multi-use apartment building with supermarket & bike share. Grasso wasn’t the only presenter at East Falls Zoning May 18th — first, a representative from NewCourtland briefed the audience on progress at the old EPPI site (not much) and plans for the immediate future (not really sure, definitely something in senior living, will check back in later). OK, then. So Grasso. He started off saying while he’s not a local guy, growing up he had an aunt who lived on Coulter Street — and he’s got fond memories of holiday visits in East Falls. He’s got a connection here, he really believes that his project is bringing good things to our area. Calumet Street’s getting widened, with designated turning lanes. He’s serious about getting a supermarket here, too. The bottom floor facing Ridge won’t be a blank wall but the window of a grocery store we can all shop in. Grasso’s also working hard to get Indego bike share here, because bikes and East Falls is a no-brainer — hello, we love bikes here, and we’re a Schuylkill River Trailhead! Grasso sees his new development as a welcoming way station for the many commuters on Kelly Drive. 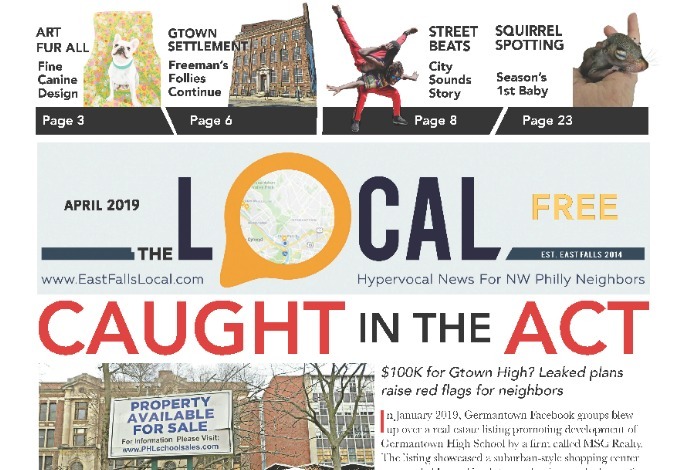 Not all were thrilled with the design, though — the loudest complaint was that the building’s beautiful terrace faces the Schuylkill, thus “turning its back” on East Falls. In the clip above, longtime EFCC committee member Meg Greenfield’s demands to know how such a structure connects the community to the river. Lifelong local (and multiple property owner) Billy Ross explains how there will actually be a lovely view corridor, and also Grasso’s design manages to front on three sides (an expensive feature that provides maximum streetscape). Plus, we need this development so bad. So. Bad. Business owner Jim Williamson of Slices Pizza agrees entirely, and supports the development 100%. Of course, his shop is basically across the street, and he stands to make a lot of cake if that empty lot he’s been looking at for 12 years turns into 200 rental units’ worth of pizza-lovers. But so what?! Who can disagree that our dead “business district” is a disgrace, and hurts our whole community? Grasso’s investing $70 MILLION into the heart of East Falls, and his project includes amenities for all of us: a supermarket, car share, traffic calming, a riverfront cafe, Indego… This isn’t a gated community he’s sectioning off, but a beacon to outsiders: Over here!! EFDC’s Gina Snyder underscores that Grasso’s designs are the result of dialog with the community: “This project responds to what this neighborhood asked for.” The design committee (which was open to the public) requested the building’s orientation facing the river, and the traffic tweaks, and so forth. Carolyn Sutton (another EFDC-er and hawk stalker) echoes Gina’s sentiments on community input, and further explains the bigger vision for Ridge Avenue & Kelly Drive — as a continuous stretch to the Wissahickon. It wasn’t all leaders and business owners speaking in favor of Grasso’s development, though. Todd Baylson began the meeting by reading a slew of neighbor emails offering gushing support (and one emphatic nay), and also we captured some quotes from the audience, who took every opportunity to literally applaud the plans. PS: What’s up with the hand signals & pantomime, guys? Editor’s Note: Shout out to Todd Baylson for running a pretty tight meeting. He kept things moving and allowed all points of view to be expressed without giving in to the BANANA faction. BUT WAIT, THERE’S MORE! Day after this zoning meeting, EFF held their meeting, reviewing Grasso’s presentation with additional facts & bullet points. Plus, some McMichael playground discussion. RECAP CONTINUES HERE! Thank you. 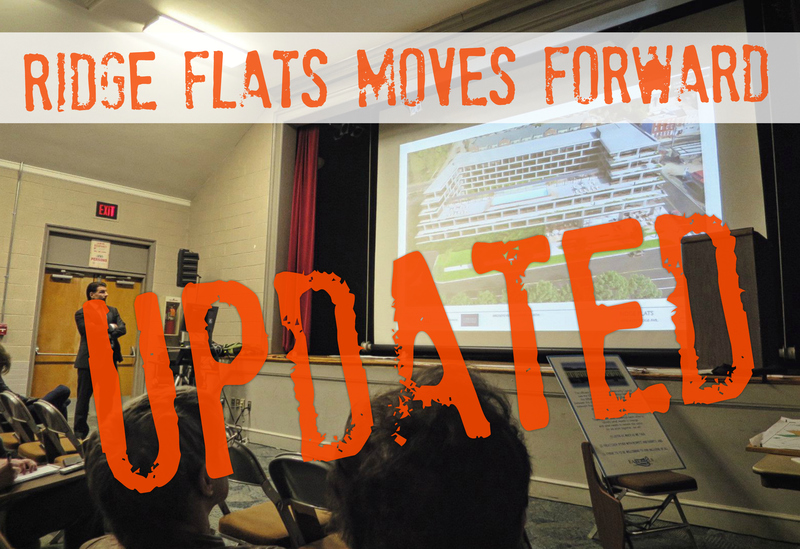 Thank you to all who have persevered in getting the Rivage site plans moving forward. For 23 years I have lived in East Falls with nothing but disappointment after obstructionist disappointment regarding that eye sore dump. Honestly , I think the “old guard” of opposition must like a graffiti ridden , trash strewn view. Why else would they find fault with every single developer over the years? Thanks for commenting, Denise — and I share your bafflement at what on earth the “old guard” has against riverfront development. I used to think it was just fear of the unknown but now I’m working on a theory that they simply don’t like this part of town having its day, ha. Jealousy? Or are they worried their control of East Falls will tip with a new influx of young professionals? Hmmmm…..
We will never be the great community we can be if Ridge Ave does not improve. Let’s move forward for the benefit of the entire community! This development looks great! I’ve always wondered why we don’t seem to have the other fun hallmarks that other neighborhoods have… Bike share, coffee shop, independent / upscale eateries. Don’t get my wrong, I love what we do have, but you can only go to the same 3 restaurants only so often without getting burn out. We want young professionals, young families, older folks, and different economic backgrounds together. The diversity is what makes a place great. It also seems like they’ll be addressing the already existing traffic congestion in that area, so they’ve really thought things through. It’s a great plan. So I’m looking forward to this development very much.